This volume brings together some of the biggest names in the field of sociology to celebrate the work of Pitirim A. Sorokin, professor and founder of the department of sociology at Harvard University. 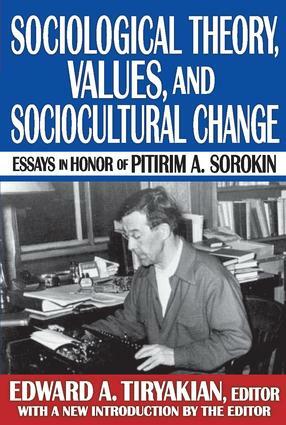 Sorokin, a past president of the American Sociological Association, was a pioneer in many fields of research, including sociological theory, social philosophy, methodology, and sociology of science, law, art, and knowledge. Edward A. Tiryakian's updated introduction examines major factors, inside and outside sociology, that have led to new appreciation of Sorokin's contributions and scholarship, and demonstrates their continued relevance. This new edition also includes an updated bibliography of works by and about Sorokin.The volume includes Arthur K. Davis, who describes Sorokin's importance as a teacher in the Socratic tradition. Talcott Parsons examines internal differentiation in Christianity in its historical Western development. Thomas O'Dea deals with the institutionalization of religious values. Walter Firey examines how actors relate their conception of a distant future to their present behavior. Florence Kluckhohn focuses upon the problem of cultural variations within a social system. Robert K. Merton and Elinor Barber examine the sociological aspect of ambivalence. Bernard Barber considers the American business's efforts to institutionalize professionalism.Other contributors include Charles P. Loomis, Wilbert E. Moore, Georges Gurvitch, Marion J. Levy, Jr., Nicholas S. Timasheff, Carle Zimmerman, and Logan Wilson. This volume is an essential collection of essays concerning the work of one of the most prominent thinkers in twentieth-century sociology.